– Sports attire with shoes. – Water and your car key (if you are driving). There will be a box to put your keys and phone. Best to leave your phone in the car. Watch, Jewellery (necklace, ring, bracelet & etc), Heart rate monitor. WHAT WILL WE BE DOING DURING THE SESSION? We may be jumping, running, squatting, push ups, sit ups, crawling and many more. – You may feel dizzy or even feel like vomitting, when you do, walk away from your current position (keep walking), put both your hands behind your head and take deep breaths, once recover you can go back to your position. – Muscles Soreness on the next day – Delay Onset Muscle Soreness (DOMS). Is normal, don’t need to do anything about it, it will recover in a few days or maximum 1 week. HOW TO ENTITLE FOR PUNISHMENT DURING THE SESSION? 11) Change the given exercise by yourself without permission. Do not expect the coach to be nice to you, the coach’s goal is to get you Faster & Stronger and do the exercise correctly, not being nice to you. – When you hear your name or being called – Shout back “OOO YES”. – You can call someone’s else name & they will Shout back “OOO YES”. – When you want to reply Yes – You shout “OOO YES”. – When you don’t know what to say – You shout “OOO YES”. 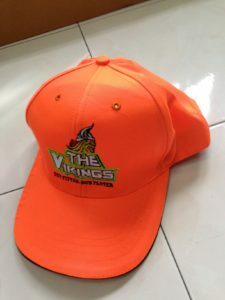 ** In the year 2019 there are 7 (or less) Vikings’ hats to be given away. First 7 warriors to get 3 ACEs in the year 2019 will get the hat. (No need to be 3 months in a row)** what is ACE?